Hi my name is Madeline and I'm here to make you gain 5 pounds. This past Thanksgiving weekend was nonstop busy but an overall great time spent with family. Thanksgiving day we went to two Thanksgivings with both sides of our family, and then on Friday early AM, we left for Baton Rouge to visit my brother and go to the LSU vs A&M football game. We hadn't been to an Aggie game since college, so it was a lot of fun to go again (and not stand the entire time, lol). We crashed at my brother's house and hung out with his roommate, played pick up basketball, ate red beans and rice and spinach artichoke dip at The Chimes, stopped to get beignets on our way home, and then drove the 9ish hours home and finally crashed on the couch with the pups late Sunday night and made a pact never to eat again. But then I woke up the other morning and was thinking about beignets and decided it was a donut I needed to make and memorize because life is short and beignets make everything sweeter. Do you know how to make a good thing even better? Make it mini!!!! 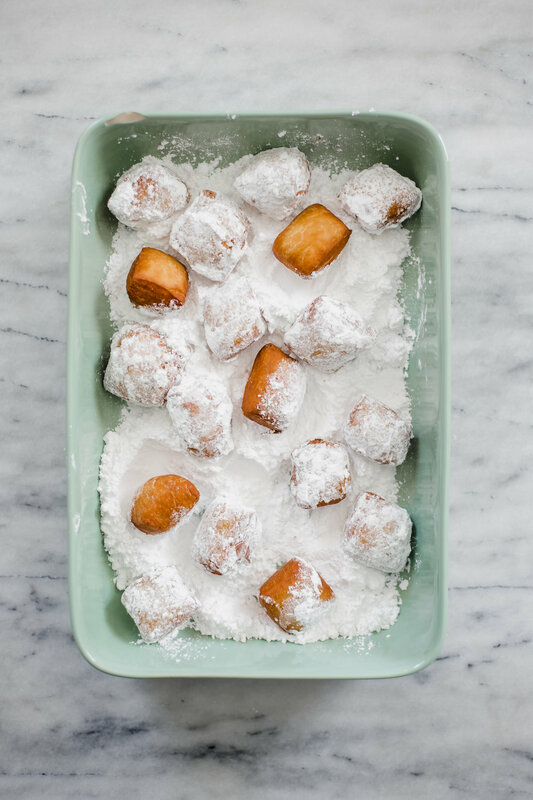 So here you go, a small batch of mini beignets that is totally doable. If you are still afraid of doughnuts and deep frying and the mess, I get you. What I absolutely love about these beignets is they can be made the night before, so the work is divided in half! Just mix all the ingredients in a stand mixer (or hand held mixer in a bowl), and let it chill out in the fridge. The next morning, wake up and have some coffee. Roll out your dough, and cut into little squares, and then heat up your oil and fry away! There is the additional messy part of all that powdered sugar, but you could contain it by just keeping it in a large bowl or baking dish like I did. The cream cheese dip is totally optional, but I love the tanginess the cream cheese gives to the overall very sweet doughnut. I made the dip while waiting for the oil to heat so it was already made when the doughnuts were. These are so much fun and remind me of the ones we had in Baton Rouge (and New Orleans a couple of years back). They are easier than you are probably thinking and will please a crowd/your breakfast table because...mini! These really need to be eaten immediately or at least by the day of. They tend to get very dense the longer they sit out. But this won't be a problem because they will not last long once you set them out. In a small cup or liquid measuring cup, combine the water and the milk. Microwave for 30 seconds, or until slightly warmed. In the bowl of a stand mixer fitted with the dough hook, add the milk water mixture and the yeast. Let sit for 5 - 10 minutes or until foamy, to allow the yeast to activate. Add the rest of the ingredients into the bowl, and stir over medium speed until a dough ball is formed and it is very soft and smooth. Add 1 tbl. of water at a time if dough is too dry and crumbly. Cover the bowl with plastic wrap and let sit for 1 hour, or until dough has puffed up (but not necessarily doubled in size). Punch the down down, and remove from the bowl. Grease the bowl with oil and add dough back in. Cover with the same plastic wrap and refrigerate overnight. The next morning, dump out dough onto a lightly floured surface and roll dough out until it is roughly a 7 x 5 inch rectangle. Using a pizza cutter or sharp knife, cut out 1 inch squares from the dough. In a deep 10 inch skillet or large dutch oven/pot, heat 1 inch of oil until 360°F. Drop 4-5 beignets in at a time, cooking on one side for 1-2 minutes or until golden brown. Flip them all over to the other side, and continue to cook an additional 1 minute. Remove with a slotted spoon to a plate or baking sheet lined with paper towels. Allow to cool for about 1 minute before tossing in a large bowl of powdered sugar. Repeat with remaining dough until all doughnuts are fried and tossed in the powdered sugar. To make the dip, beat the softened cream cheese until smooth and creamy. Add the powdered sugar and the milk, one tablespoon at a time, and mix on medium high speed until smooth. Add more milk if needed to get desired consistency. 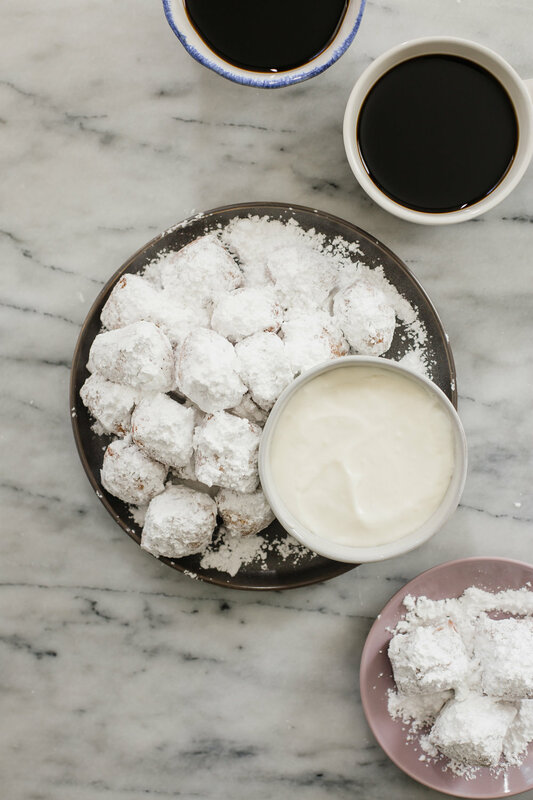 Serve beignets immediately with extra powdered sugar (don’t be shy!) and the cream cheese dip. These are best the morning of!